Mentoring is a relationship in which someone with more experience or a broader perspective in a particular role or activity (the mentor) helps someone with less experience in that area (the mentee) to develop the understanding and awareness that will help them to be successful and adapt quickly to new situations. In these series of podcasts we explore the case of mentoring; how to be an effective mentor and getting the most out of mentoring. In this series of podcasts we focus on becoming an effective mentor, specifically exploring the 4 key requirements to be an mentor. In this podcast we explore the importance of understanding needs and goals as part of something called Self Determination Theory. In this podcast we focus on the various roles you might employ in your mentoring relationships. In this podcast we focus on the 3 fundamental elements to mentoring: vision, support and challenge. Getting the most of mentoring part 1 : Is mentoring right for you? In this series of 3 podcasts we explore whether mentoring is right for you by encouraging you to ask yourself a number of important questions. Getting the most out of mentoring part 2 : What can mentoring do for you? In this podcast we explore how mentoring can benefit you. In this podcast we explore a range of tips and techniques you can use to increase the likelihood of having a positive mentoring experience. Making the case for mentoring part 1: What is mentoring? In this podcast we look at some of the main benefits of mentoring either as a mentor or as a mentee or an organisation. Making the case for mentoring part 2: How does mentoring differ from counselling and coaching? In this podcast we discuss the differences between mentoring, counselling and coaching. Research discussed in the previous podcast demonstrated that mentoring tends to work well when mentor and mentee share similarities on deep-level characteristics, such as values, beliefs and personality. So it is probably worth spending time early in the process exploring these things with your mentee. And if you would struggle to articulate your guiding values, worldview beliefs and personality preferences, then maybe you need to develop a little more self-awareness before taking on a mentoring role. Ask questions and listen before giving answers and advice. Be the first to admit your mistakes, be open about your limitations and volunteer your weaknesses. Be accepting of your mentee’s failings. Keep your promises and keep your mentee’s secrets. All of this also requires a certain amount of self-awareness. You should aim to finish every mentoring meeting with your mentee having grown in at least one of these areas. A poor mentor can often do damage by allowing their own selfish needs to override these fundamental needs of their mentee. For example, your need for status and certainty might tempt you to push your ideas and your solutions on to your mentee, thus depriving them of the opportunity to develop their autonomy and competence. If you fail to respond to them because you are too busy, you run the risk of exacerbating any feelings of disconnectedness and lack of appreciation. Even positive intentions can cause damage if you don't pay proper attention to these needs. You may be keen to help them become better at dealing with their tasks, but if your helping consists of mostly critical feedback, you may destroy their sense of competence rather than building it. At the same time you do need to be sensitive to your own needs within the mentoring relationship. These might be practical needs, such as needing to be clear about the amount of time you can afford to give to your mentee. But it is also about your own developmental needs. For example, you may be considering taking on a mentor role because you want to develop skills that will be useful to you in the future. Or maybe you want to get a fresh perspective on your own work. These are legitimate reasons for becoming a mentor, but be upfront about them with your mentee. They will then know to give you useful feedback or chip in ideas. The best practice is for you to enable the mentee to articulate clear goals for the mentoring process and be explicit about how you can help them to achieve those goals… and for you to be explicit about your goals for the process and clear about how your mentee can help you. As a mentor you may find yourself taking on a variety of roles in relation to your mentee. You may need to take on the mantle of an adviser, a teacher, a confidante, a coach, a cheerleader, a sounding-board, a mirror, an agony aunt, a devil’s advocate or any number of other functions. Some of these roles may be comfortable to you and others less so. However, as we’ve just hinted at with the previous requirement, one of the best default roles to adopt in your mentoring relationship, that will increase the chances of benefits for both your mentee and for you, is that of co-learner. If you see yourself and your mentee as partners, combining two sets of knowledge and experience so that you can solve problems together, develop together and make progress towards your goals together, you are more likely to support the needs of your mentee and to realise the potential benefits for you as a mentor. At the same time you are providing a positive role model as a self-directed learner. Again, it is probably a good idea to make this co-learning approach explicit during the early stages of the relationship and to let your mentee know which other roles you may or may not be able to fulfil if needed, as this will help in establishing trust. As the mentor it is also your responsibility to facilitate the development of the relationship. This means gently initiating conversations in which the mentee’s goals are discussed and negotiated; opening up the possibility of taking time to evaluate progress and, when appropriate, finding ways to discuss concluding the relationship. That said, it is important to remember that the mentee – not you – owns the process, and that the mentee is responsible for his or her own learning, at his or her own pace. One of the simplest ways to think about what you are doing as a mentor is in terms of three fundamental elements: vision, support and challenge. helping them to formulate stretching but achievable goals. The art of mentoring is in finding the right combination of support and challenge to stimulate optimum growth in your mentee. Too much support and not enough challenge may leave your mentee feeling great about themselves but won’t stretch them enough to enable them to meet future challenges. Too much challenge and not enough support may give your mentee an accurate view of how they need to develop but could leave them feeling too inadequate for the task. The most common mistake poor mentors make is to assume that the mentee will appreciate the same balance of support and challenge that the mentor themselves would like. This is a dangerous assumption no matter how similar you and your mentee are. Is my intention with this contribution to support or to challenge and what does my mentee need from me now? How can I ensure that my mentee knows that this is my intention? What impact is my contribution having on my mentee? Finally, one of the most important activities and key skills of a mentor is listening. For a poor mentor, listening is merely waiting for the next opportunity to force-feed your hard-won knowledge and valuable opinions into your mentee. Whereas the mentor who takes seriously the role of co-learner will always approach listening as an opportunity to transform their own thinking first. Transcript | Getting the most of mentoring part 1 : Is mentoring right for you? One of the first things you should do to increase your chances of getting the most out of mentoring is to listen to the previous two podcasts in this series as this will help you to understand the potential benefits of mentoring and give you an idea of what to look for in a great mentor. In this podcast, we will help you to think about whether mentoring is right for you by encouraging you to ask yourself some important questions. We will look at the potential benefits of mentoring for the mentee and at what you can do to increase your chances of having a positive mentoring experience. What do you hope to gain from this relationship?Are you being reasonably realistic about what is possible in a mentoring relationship?Do you think that mentoring the most appropriate way to get what you need? Do you know what characteristics to look for in a mentor, so that they will be ready, willing and able to address your needs? Are you ready to listen and are you open to change? Are you ready to contribute as well as to receive? It is worth pointing out that you don’t necessarily have to have very specific goals in mind before deciding to seek a mentor. Sometimes our focus and sense of direction in life isn’t that clear cut. In some cases you may not have a definite picture of what it is that you’d like to achieve; you might simply have a vague sense of being stuck in a rut, or knowing that you’d like to make a change but not knowing exactly what that change will look like. Or perhaps you’ve been alerted to the fact that you might be losing your job and you need someone to talk to about that. So the fact that you don’t know exactly what you want isn’t in itself a reason not to seek out the kind of support you can get from a mentor. In many cases, a sense of direction and focus can be teased out by starting to engage sort of open, responsive conversation that happens in a mentoring relationship. Transcript | Getting the most out of mentoring part 2 : What can mentoring do for you? As mentioned in the previous podcast for mentors, one of the most commonly reported benefits of mentoring for both mentor and mentee is work-related learning — helping the mentees to become better in their role. This could represent the mentor sharing helpful knowledge about the organisation, the department or the specific role with the mentee. 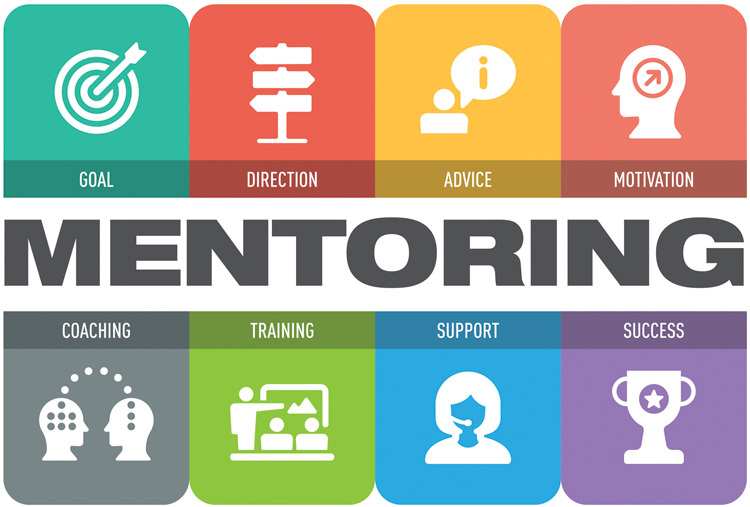 If the mentor is outside the organisation the mentee works in, there are benefits to the mentor demonstrating effective behaviours to the mentee through role modelling, or the mentor helping the mentee to develop their own approach to specific tasks through encouragement and feedback. Another common benefit for mentees is career enhancement. Often this is through the mentee being able to discuss and refine their career plans with the mentor, perhaps receiving help in identifying appropriate development opportunities and making crucial career decisions. This can happen whether or not both individuals work in the same organisation. In some cases, the mentor may provide direct opportunities to work on career-enhancing projects that increase the mentee’s visibility within their organisation. They may also provide access to important networking opportunities inside and outside the organisation. The next potential benefit of mentoring is social, psychological and emotional support. Your mentor can be someone you go to in order to unburden yourself about your worries and your insecurities. Many people in positions of responsibility experience uncertainties such as impostor phenomenon — where you believe that you are not as competent as everyone thinks you are and you are soon going to be found out. In a safe mentoring relationship, you can receive reassurance, acceptance and emotional grounding. And again, this kind of support is invaluable whether or not you work in the same organisation. As well as the potential benefits, it is also worth being aware of the potential dangers of mentoring. A common problem in mentoring is a mismatch between the mentor’s and the mentee’s expectations about who will be putting the most effort into the relationship and who will be getting the most out of it. If you are expecting your mentor to solve all of your problems for you, then you are probably heading for disappointment. If you learn best by discussing practical examples, but your mentor really enjoys theoretical models, then you are probably going to experience a certain amount of frustration. Some mentors may just want to impress you with their accumulated knowledge and skills, not caring if they are actually relevant or beneficial to you personally. They may be so keen to produce a clone of themselves that they will expect you to adopt their way of doing things even if it is out of date and not appropriate for your personality or the specific situation you are dealing with. On the other hand, if all you are doing is trying to impress your mentor all the time, you are unlikely to learn anything from them. They may be so bad at giving useful feedback that the poor mentee ends up feeling demoralised and helpless. However, as a mentee, you may miss potential learning opportunities by being too narrow minded to notice unexpected lessons or by being too defensive to benefit from well-intentioned constructive criticism. In highly politicised organisations being a poor mentoring relationship could be career limiting rather than career enhancing, either because the mentor or the mentee betrays secrets shared in confidence or because of reputational damage caused by being linked to an unpopular or controversial person. Bearing in mind the potential benefits and dangers, here are a few tips for increasing the likelihood of having a positive mentoring experience. The first tip is to be as clear as possible about your own expectations for the mentoring relationship. As we discussed earlier, this isn’t the same as being completely clear about all your goals. Your mentor will help you to identify direction and goals as the relationship develops; but it is important to have a realistic view of what the relationship is likely to achieve and, to some degree, what you’d like to get out of it. This will increase your chances of obtaining a mentor with the appropriate characteristics. If you want to develop your abilities by finding a role model you can learn from, make sure your mentor has relevant experience and a track record of successful achievements in that activity. If you want increased organisational exposure and access to better networking opportunities, then make sure your mentor is well connected and sociable. If you want help to identify the best opportunities to enhance your career prospects, it may be best to work with a mentor who combines sociability with a diverse career experience of their own. If you want to develop your own ability to solve problems and make decisions, then find a coaching mentor with strong communication skills, especially the ability to listen and ask questions that make you think. Good communication skills and empathy are also important if you want encouragement and confidence building. In addition, because emotional support requires high levels of trust and honesty between mentor and mentee, you need to be sure that you both share similar values. Another general tip is to avoid having a mentor who also has direct or indirect supervisory responsibility for you. This can present too much of a conflict of interest for the mentoring relationship to work effectively. Being transparent about your own needs and expectations, should be balanced by you being open to the needs and expectations of your mentor. If both mentor and mentee start by being open about their expectations and by negotiating how their various needs could be met, then that provides the best foundation for a good mentoring relationship. As a mentee, you are more likely to have a beneficial experience if you think about what you can add to the relationship as much as what you can get out of it. Listen to the podcast on how to be a good mentor to identify some of the benefits you could bring to your mentor. For example, many organisations have introduced something called reverse mentoring, in which younger members of staff share their greater experience of new technologies, such as social media, with more senior employees. Mentoring is not something that tends to produce instant results. It usually requires an ongoing investment of time and effort from both mentor and mentee for it to pay off. Having said that, depending on the type of benefit derived, some mentoring relationships will have a natural shelf life beyond which neither mentor nor mentee are gaining enough to justify the investment. This doesn’t necessarily mean that the relationship has to come to a complete end. You may shift to a less frequent interaction, or it may be that the relationship transforms into something different, such as ongoing friendship. Whatever happens, it is probably best to mark the transformation in the relationship explicitly rather than just letting it fizzle out, in order to give both parties a proper sense of accomplishment and closure. Transcript | Making the case for mentoring part 1: What is mentoring? Welcome to this series of podcasts on mentoring. In other podcasts in this series we will look at how to approach mentoring in order to do it well and to get the most out of it – as both the mentor and the mentee. In this podcast we will look at some of the main benefits of mentoring. This could be helpful if you are deciding whether it would be worthwhile for you to take part in a mentoring programme as a mentor or mentee. It could also be helpful if you are trying to persuade your employer to support your involvement in mentoring. We will look at why mentoring can be good for the mentee, good for the mentor and good for their organisation. We will also examine some of the common problems that can occur with mentoring and what you can do to avoid them. You can download a handout some of the key resources and articles containing evidence if you need more details. Career development support – helping individuals to take more control of their career progression and to develop their talents. Psychosocial support – helping individuals to fit into organisations, deal with change or handle other challenging situations in the workplace. Role modelling – helping new entrants to become more effective in a specific work role, such as management, by providing exposure to the exemplary thoughts and behaviours of someone with more experience. Transcript | Making the case for mentoring part 2: How does mentoring differ from counselling and coaching? How does mentoring differ from counselling and coaching? There is some debate over the intersection between mentoring, counselling and coaching. Mentoring is not a strict discipline, and many of the skills associated with mentoring are also used in counselling and coaching interactions. These might include active listening, questioning and summarising and the ability to empathise, understand and respond sensitively to another’s concerns. The goal in each case is to facilitate the exploration of needs, motivations, desires and thought processes to assist the individual in making real, lasting change. Counselling typically (but not always) focuses on the past with a view to helping an individual to resolve current emotional issues. The relationship between counsellor and client is often long-term and there is minimal (if any) personal disclosure from the counsellor. Coaching focuses on the present situation with a view to helping an individual to achieve certain developmental goals. It is usually a short-term relationship in which the coach’s primary goal is to help an individual to gain new skills or improve performance. The coach sometimes (but not always) provides direction or instruction in a specific area of expertise. There is limited personal disclosure from the coach. Mentoring also tends to focus on the present situation with a view to helping an individual to manage their own learning in order to maximise career potential. It can be an extremely long-term relationship in which the mentor’s main goal is to provide personal support during learning, rather than providing instruction in a specific area of expertise. The mentor questions, challenges and provides options, rather than teaching or providing answers. There can be a significant amount of personal disclosure, if relevant, from the mentor.